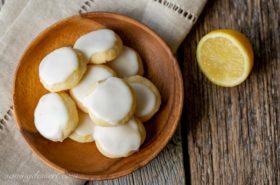 Over the last couple of years I’ve found my favorite recipes are the ones that have pure, almost simple flavors sometimes enhanced by sweet, tart or salty compliments. When it comes to desserts a single note is not always a bad thing. 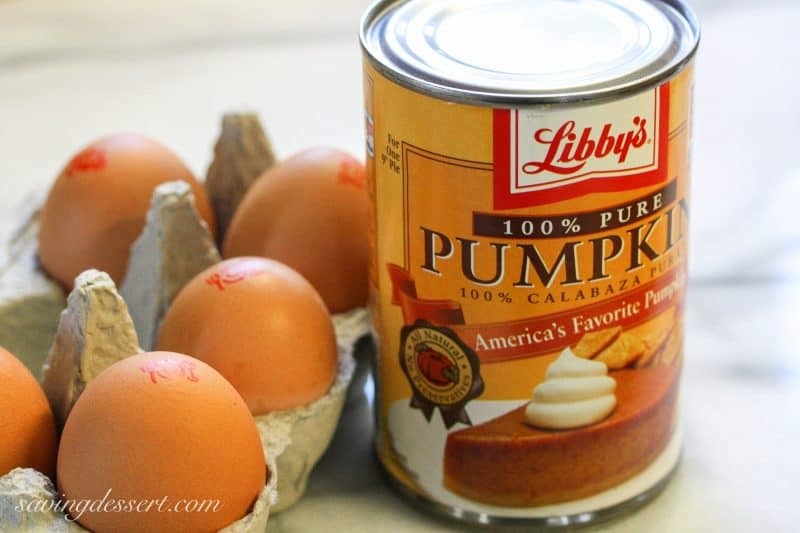 You know how pumpkin pie has complex flavors while also tasting completely unique? That’s how it is with this Gelato. It tastes exactly like pumpkin pie, whipped cream and all! I really enjoy making ice cream, sorbets and Gelatos. You can tuck it away in the freezer and don’t have to eat it all in just a few days. I love being able to pull out a container of homemade ice cream to serve unexpected guests. This time of year serving a pumpkin dessert is like a bonus! 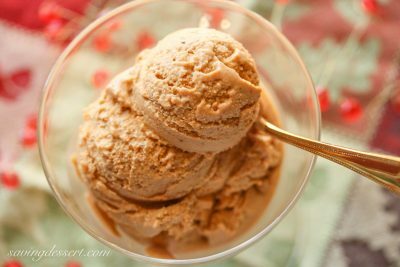 I’ve been looking around for a recipe for pumpkin ice cream or Gelato and haven’t been able to put my finger on just the right combination. So I came up with my own and am very pleased with the results. There’s no doubt about the distinct flavor so if you’re not into pumpkin pie, you probably won’t be into this dessert either. It tastes exactly like a crust-less frozen pumpkin pie. For those of us who love the hints of cinnamon, ginger and nutmeg – rejoice! This frozen pumpkin dessert is ready for prime-time. 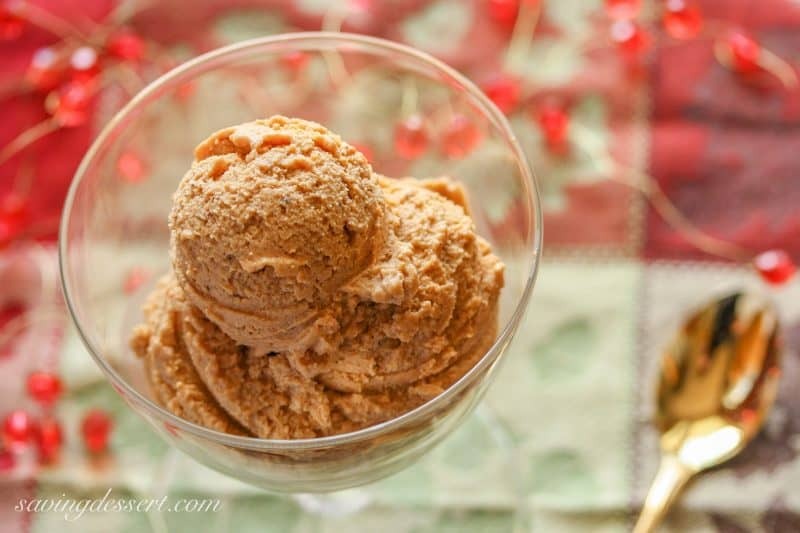 All the flavors we love in a pumpkin dessert in a creamy bowl of gelato! Pour 2 cups of whole milk into a medium heavy bottom saucepan. Whisk in the brown sugar and heat over medium until an instant-read thermometer reads between 180 and 190 degrees. Continue to heat and cook at this temperature for 5 minutes, stirring constantly. Remove the milk and brown sugar mixture from the heat and allow it to cool 5 minutes. In a medium non-reactive bowl whisk together the egg yolks, salt and 1/4 cup granulated sugar until foamy and slightly thickened. Slowly temper the eggs by drizzling spoonfuls of the hot milk mixture into the eggs while whisking constantly. Once about half the milk is whisked into the eggs, pour the egg and milk mixture into the remaining hot milk mixture and stir until well blended. Return the pan to the stove and heat on medium. Stir constantly with a wooden spoon until the mixture reaches 185 degrees on an instant-read thermometer or is thick enough to cot the back of the spoon. Make sure the mixture does not boil. Add the canned pumpkin, cinnamon, ginger, nutmeg and allspice to the hot milk/egg mixture. 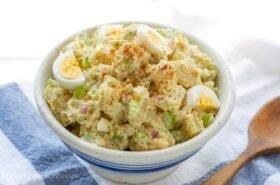 Carefully emulsify the mixture with a stick or hand blender or regular blender. Pour the 1 cup of heavy cream in a clean large stainless-steel or glass bowl set over an ice bath. Pour the pumpkin mixture into the cream and add the vanilla and bourbon. Whisk until fully incorporated. Stir occasionally, about every 5 minutes or so, until the mixture has fully cooled. Remove the mixture from the ice bath and dry off the bottom of the bowl if necessary. Cover the Gelato with plastic wrap and chill in the refrigerator overnight or at least 8 hours. When ready prepare the Gelato using your ice cream maker and follow manufacturer instructions. Store the frozen Gelato in an airtight container until ready to serve. If you prefer a harder frozen Gelato, omit the bourbon. Our new neighbors across the street put up their Christmas decorations this weekend. Do you put yours up this early or do you decorate after Thanksgiving? We’ve never decorated before Thanksgiving because I love the fall decorations and colors. I have a few more weeks of leaves and acorns! Besides I’m a one holiday at a time kinda girl. One question: packed or unpacked on the brown sugar? Pumpkin. Gelato. 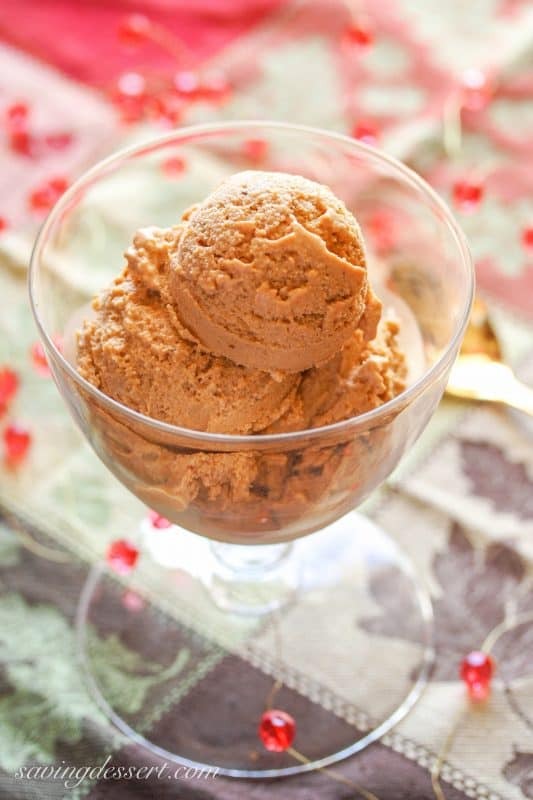 Pumpkin gelato. Oh my gosh this is awesome. Nice job, Tricia! I'm suddenly loving the idea of this for a milkshake too. Love this flavor for a gelato Trisha! 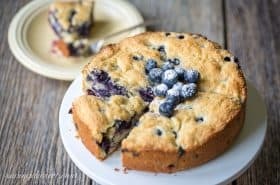 This would also be a great Thanksgiving dessert for those having a small gathering. Ohh yeahhh, give me a (large) scoop of this and just dollop it on top of my pumpkin pie pretty please!! 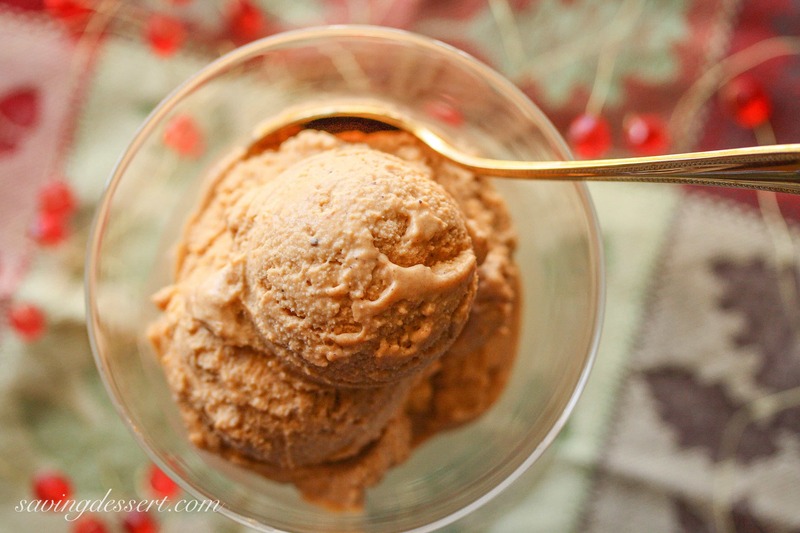 I have been obsessed with pumpkins these days….save a scoop for me, Tricia! Wow Tricia—this looks so good, and so perfect for pairing with Thanksgiving pies. 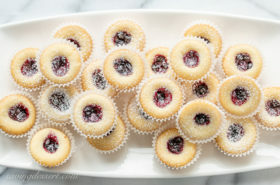 The photos look like they're straight out of a fancy cookbook—love this, pinned and bookmarked!!! What a wonderful creation you've come up with here Tricia! 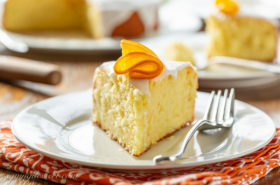 It sounds delightful and I just happen to have some pumpkin waiting to be transformed into something yummy like this! I don't know that I've ever had a pumpkin ice cream or gelato, but this sounds fantastic!